Austin Richard Post (aka Post Malone) is an American hip-hop artist, songwriter and producer. 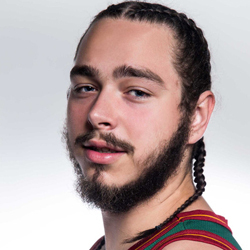 Became well known in February 2015, after the release of his debut single White Iverson. This was followed by a joint track with Justin Bieber и Quavo, that have recived USA platinum status. The greatest success was achieved by a joint single with a rapper 21 Savage, Rockstar, which took the first place on the Billboard 200 chart and a number of other regional charts. In August 2015, Post Malone signed a contract with Republic Records. The first studio album Stoney, reached number 6 on the Billboard 200, was released in December 2016.